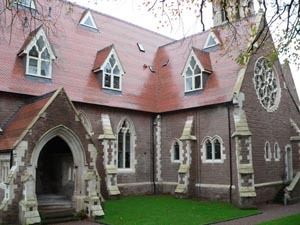 HIGHLY COMMENDED at the CRTC Awards - "Best Ecclesiastical Redevelopment"
This Gothic Grade II starred listed church was built in 1852 by the eminent Victorian Architect SS Teulon. The church was unused since 1975 and had become derelict and subject to vandalism, theft and decay. It was regarded as uneconomic to develop until the recent considerable rise in residential property values. The redevelopment of the deteriorating building into twelve luxury apartments was welcomed by both the Victorian Society, the Birmingham City planners and Conservation Officer who were delighted to see it restored for a new purpose. DLG Architects explained that the design principle was to regard the original building as totally empty volume and to erect a new independent frame within, so that the walls carry no additional load. In theory the new internal work could be removed by future generations and the building restored to its original state! 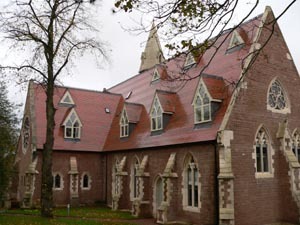 The challenge was to retain and restore the original features of the church and provide a series of modern spaces in a contemporary style to complement the original elements. 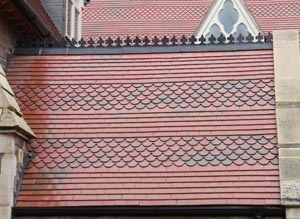 The original roofing specification was to strip and reuse as many tiles as possible and make up with second hand. 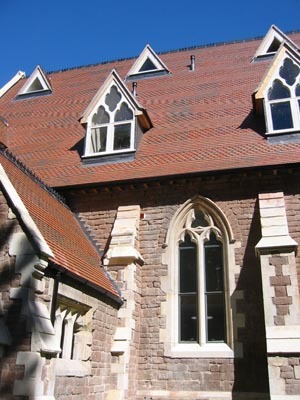 The impossibility of finding matching second hand ornamental tiles and fittings in such quantities was evident to Lewis Roofing who requested Dreadnought to offer new tile alternatives. 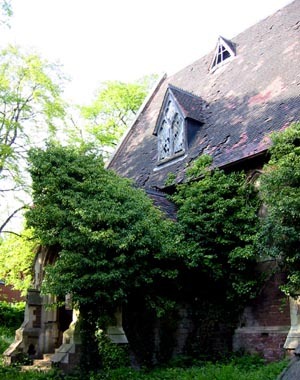 This is a conversion that has attracted considerable interest in the press both nationally and locally, not merely for its architectural and technical merit but because the problem of maintenance of ecclesiastical architecture becomes ever bigger as society becomes increasingly secular. This scheme represents a very sensible solution and the conservation bodies involved are rightly pleased with the results.